This book describes the main pathologies observed among Argentine and British Malvinas war veterans which were published by the author in the International Review of the Armed Forces Medical Services (International Committee of Military Medicine-Hôpital Militaire Reine Astrid, Brussels, Belgium). 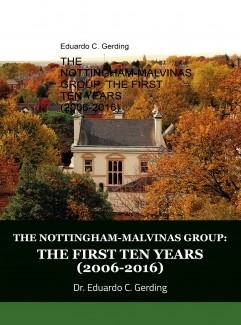 In 2006, after his lecture at Willoughby Hall (University of Nottingham, UK) the author founded The Nottingham- Malvinas Group where veterans of both countries became acquainted. Each chapter provides a detailed analysis, not only of some of the most relevant combats, but also of the various current approaches to dealing with the sequelae. The author's attendance to the Stress Center in the UK provides an even broader picture of how these pathologies are dealt with. Dr. Gerding finally closes with a chapter on reconciliation.